In 1920, as Ireland became embroiled in an ever increasing war of attrition between the forces of the British Crown and those of the Irish Republican Army, Protestants, though an overall minority in Ireland, had held power ever since the reign of William III and did not relish the thought of Catholics usurping that power in an independent state, whether it be under Home Rule or a republic. The Protestant Unionists of the northern province of Ulster began to feel that the time had arrived for them to separate from the rest of Ireland. In Ulster, where the two religions were almost equal in number, the unionists accepted that not only would they have to separate from the other three provinces but indeed, they would have to abandon large tracts of Ulster itself in order to secure for them a state in which they would be strong enough to retain power. This would mean that the counties of Monaghan, Cavan and Donegal which contained large Catholic majorities would be seceded to southern Ireland. It was even believed that parts of Derry, Tyrone, Fermanagh, south Down, and south Armagh which had large Catholic populations, would also be abandoned. In order to protect this new Ulster from attacks by the IRA, the Ulster Unionist Council leaders, Craig and Carson, mistrustful even of the RIC, were convinced that a new force was needed and that that force should consist of local Protestants. Even as Lloyd George allowed the recruiting of the Black and Tans and Auxiliaries to proceed, Sir Basil Brooke, a landlord from Fermanagh was raising a vigilante force by recruiting ex- soldiers who had survived World War One. In July 1920 Carson and Craig requested Lieutenant-colonel Wilfred Smith to start organising this new force, even though the authorities in Dublin Castle and General Sir Neville Macready commander in chief of the army in Ireland were opposed to the idea. Smith was aided by fellow lieutenant-colonels George Moore Irvine and Fred Crawford. The army were working hand in hand with the unionists and the UVF knowing that a self-contained army in Ulster would allow them to move regular army units south. Eventually Lloyd George was forced to concede to unionist demands and issued orders establishing the Ulster Special Constabulary in October 1920. Group A, numbering around 2,000 men, would be paid full time, armed and mobile operating much as the RIC did. Group B, (B Specials) numbering approximately 20,000 would be part time, uniformed but unpaid. They would be armed but they would have to draw their weapons from a barracks when going on duty. Their remit was the safeguarding of their own areas. Group C was an unspecified number of men who would only be called upon in times of extreme emergency. Some elements within the new force which overwhelmingly Protestant and unionist, was very soon engaged in vicious and murderous reprisal attacks on the Catholic and nationalist population in the six counties, though it must also be admitted that other Specials help to protect catholic homes and businesses from rampaging loyalist pogramists. The IRA, in later years admitted that the USC were effective in countering their efforts in what was to become Northern Ireland. So effective in fact that both the A and C Specials were stood down in the autumn of 1922 leaving only the B Specials. The forming of An Garda Síochana and R.U.C. 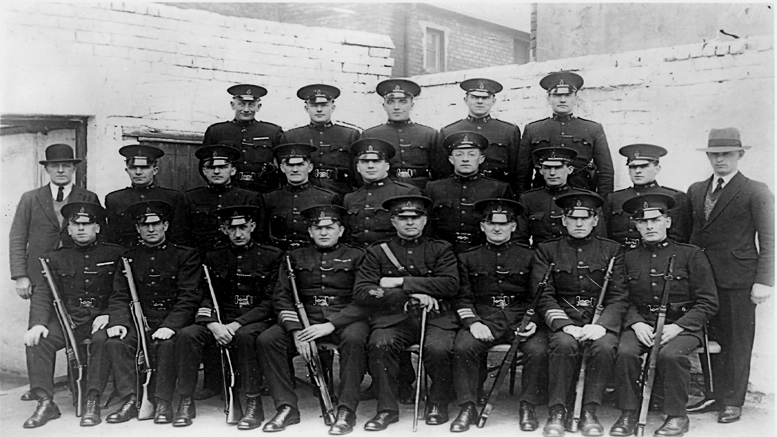 When Dáil Éireann ratified the Anglo Irish Treaty in January 1922, Ireland and Britain agreed to the disbandment of the Royal Irish Constabulary. In the six counties the RIC had in the meantime been put under the control of the northern parliament. It was to be replaced in southern Ireland by the Civic Guards (An Garda Síochana) and in northern by the Royal Ulster Constabulary. The RUC, with a nucleus of transferrals from the old RIC, was to number 3,000 men. Their remit was not only to maintain normal law and order but also to protect the state of Northern Ireland from armed and outlawed groups. Whilst nominally open to people of all denominations, the reality of the matter was that it was a predominately Protestant force whose senior officer, the Inspector General, was appointed by the governor of Northern Ireland and responsible to Minister of Home Affairs for Northern Ireland. As with the USC there were rogue elements within the force that were willing to participate in or collude with the killing and victimisation of Catholics. In 1922 one district inspector who was dismissed for his extreme sectarian views was regarded by Catholics as being the instigator of the killing of the male members of the McMahon family and a bar man who worked for them. Catholics, who by and large considered the RUC to be the military arm of the unionist government, neither sought entry to it in great numbers nor were they wanted. With events such as the attack at Burntollet bridge the RUC would remain untrusted within the Catholic community right up 2001 when they became reformed to the Police Service of Northern Ireland (PSNI).